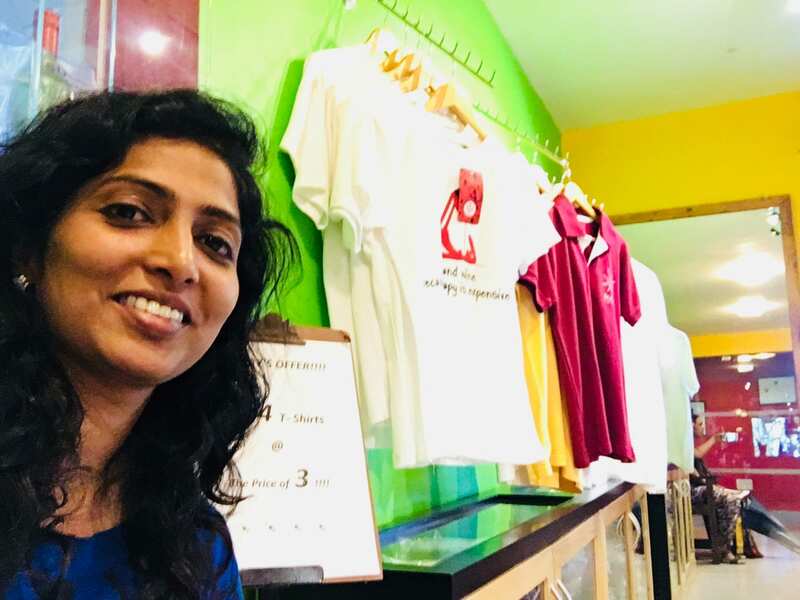 Home » Celebrities » Cinema » Comments » Countries » Crafts » Popular Articles » tours » Travel » wine » Mumbai Memoir- A walk in the ‘Sula Vineyards’ Shraddha’s Favourite Article of 2018. 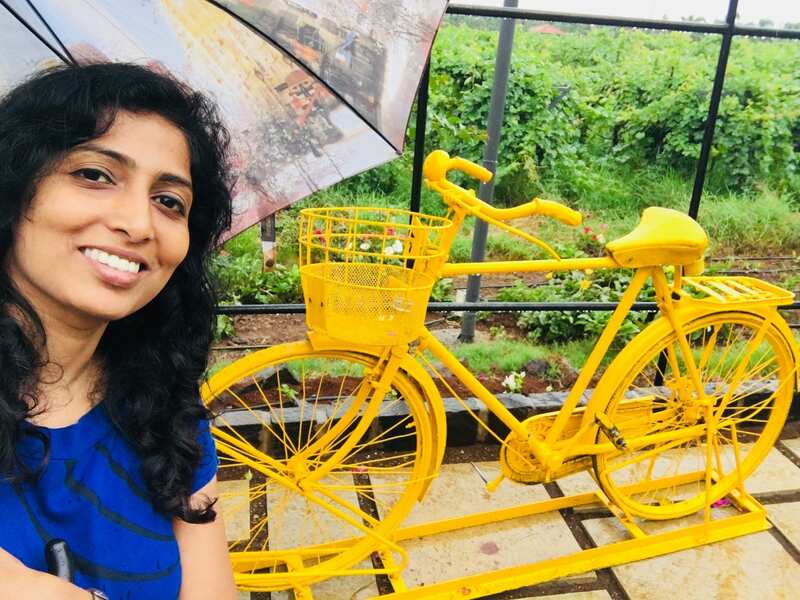 Mumbai Memoir- A walk in the ‘Sula Vineyards’ Shraddha’s Favourite Article of 2018. Purchased a bottle of grape oil from Sula shop. Yet another year is coming to an end. This year has been a very hectic but meaningful in many ways. I believe, ‘Life is all about making positive memories’ and indeed the year 2018 offered me various opportunities to make the best of it. Portion of Sula Vineyards, Nashik. 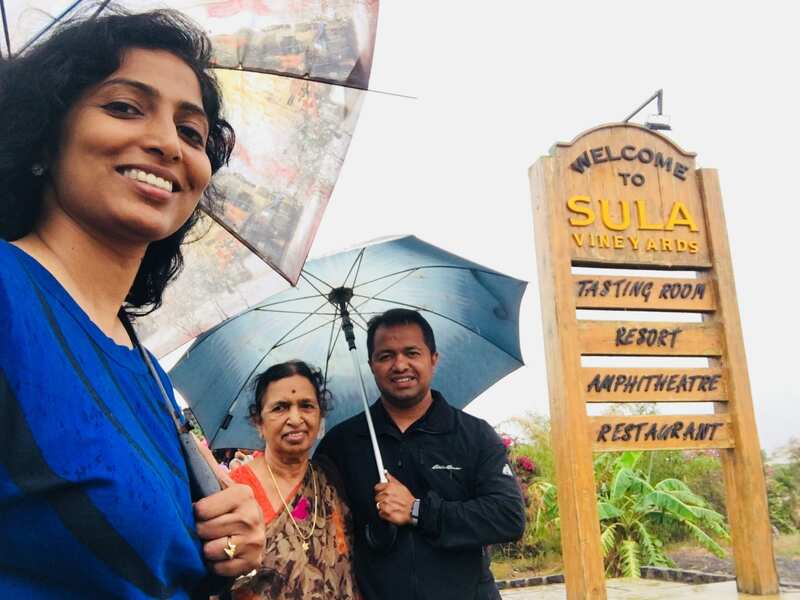 One such good memory, which has been expressed in one of my article, is my visit to Sula Vineyards, Nasik, with my family. I cherish that article to be this year’s favourite article of mine, which I present to you once again as I enjoy sipping hot coffee in the chill Mumbai winter and watch the twilight weeks of the year 2018 pass by. In 1995 a Keanu Reeves starred movie named ‘A Walk in the Clouds’ was released. It is a romantic period-film set in Sacramento, California region. The story telling of director Alfonso Arau brews the romance between the central characters in the backdrop of a vineyard, which has been beautifully filmed on the big screen. The film left a mesmerising effect on me. An artistic glass sculpture made out of Sula bottles. Here is the trailer of the film: https://www.youtube.com/watch?v=cULvtpaIK9I Since then I kept fantasizing of visiting a vineyard someday. 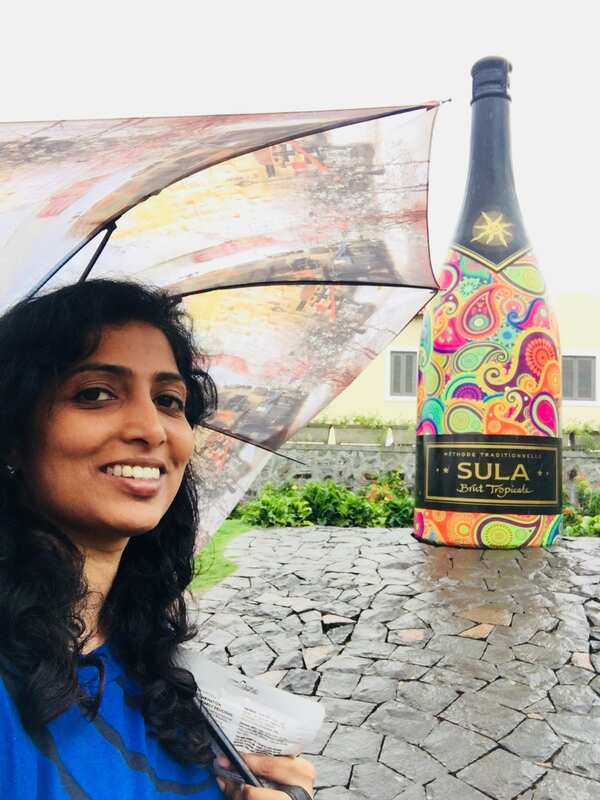 With my visit to Sula Vineyards last month, my 23-year old fantasy turned into reality. The vineyards are located just 170 kilometres from Mumbai. My visit there was pending since almost a year due to my chaotic urban commitments. 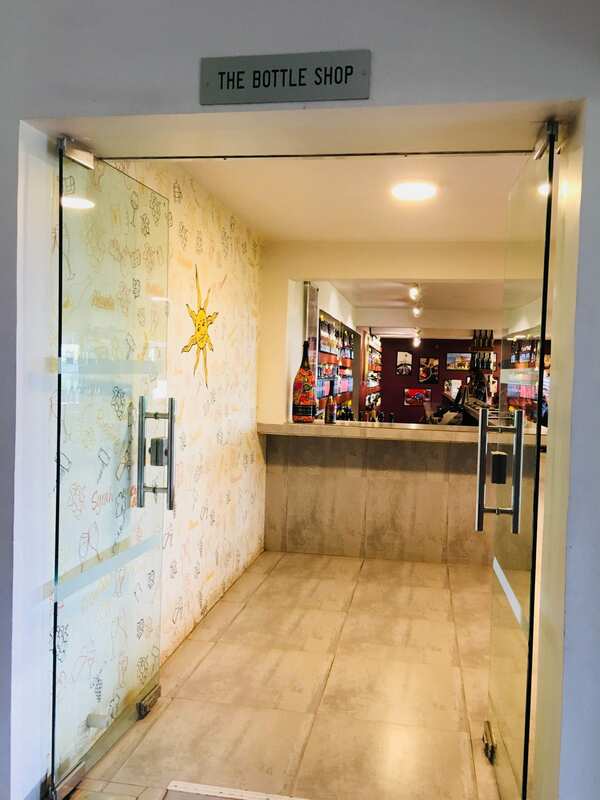 The sales shop of Sula Wines. 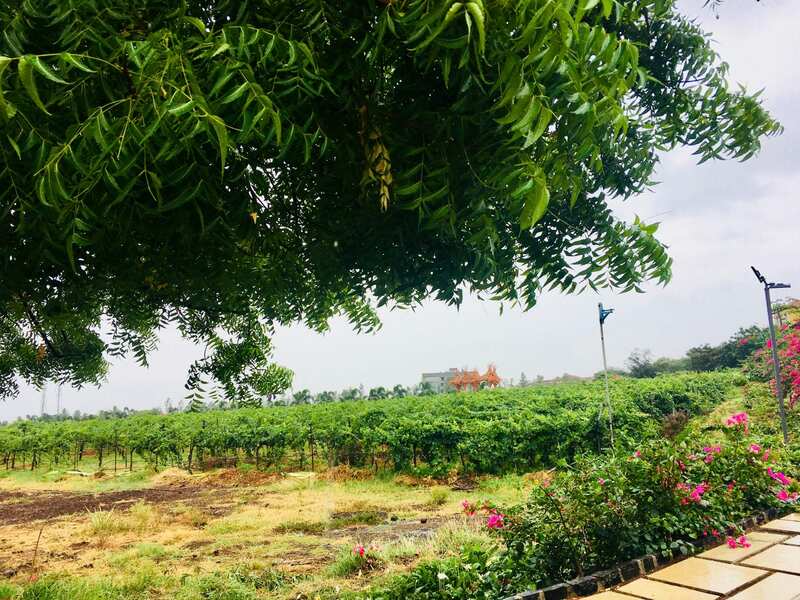 Finally, during my recent visit to Nashik along with my family, I got the opportunity to visit the vineyards. 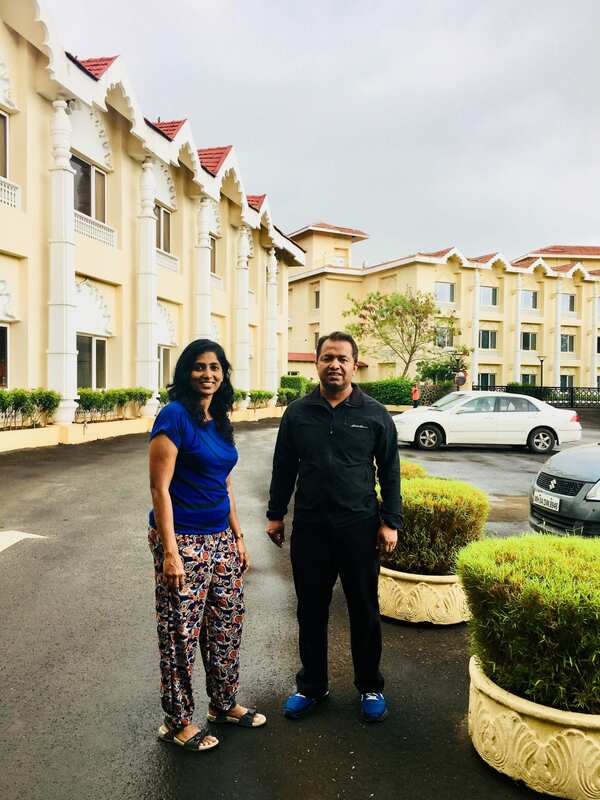 The Manager at The Gateway Taj’ Hotel in Nashik, recommended us to visit Sula Vineyards and provided us entry passes to experience the vineyards and ‘walk into the farms’ and enjoy. The tour guide explaining the wine grape processing. The stainless steel grape fermentation storage containers in the backdrop. 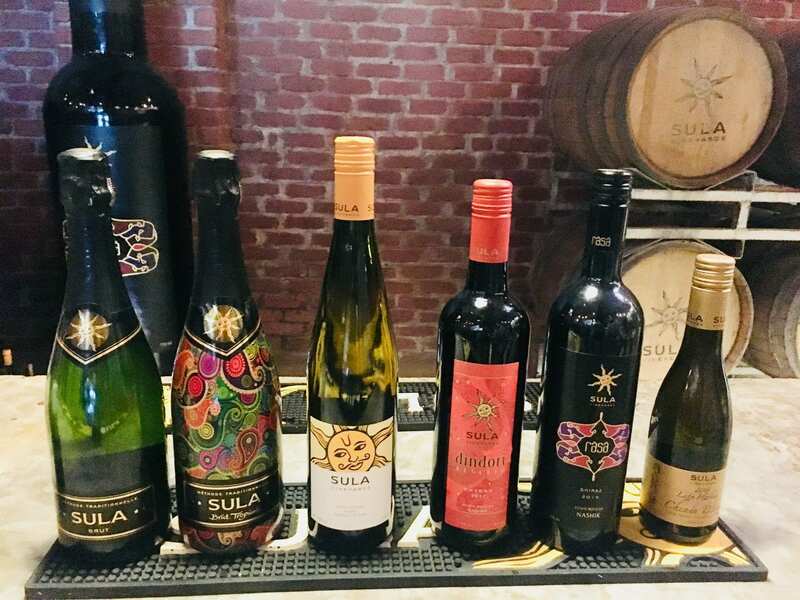 The 6 Sula brands presented during the wine tasting session. Nashik is called as the ‘Wine Capital of India’ and 60% of India’s wine is made at Sula Vineyards. 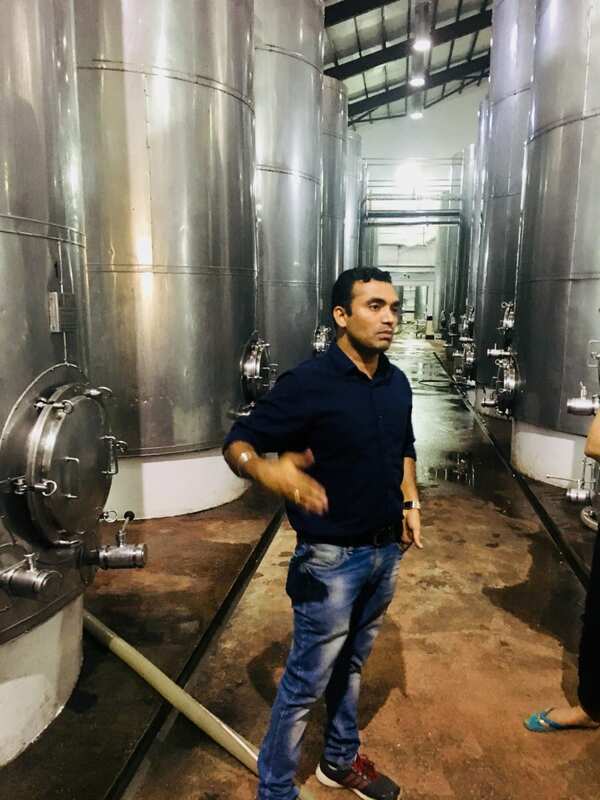 Rajeev is passionate about placing Nashik and Dindori region on the world map so that the region gets its due recognition among wine lovers of the world. Today Sula vineyards are spread over 300 acres over the Dindori hills with the Gangapur lake flowing by. The vineyard grows Sula’s premium red grapes like the Cabernet Sauvignon, Shiraz, Zinfandel, Malbec & Tempranillo which bottles 10 million bottles each harvest! 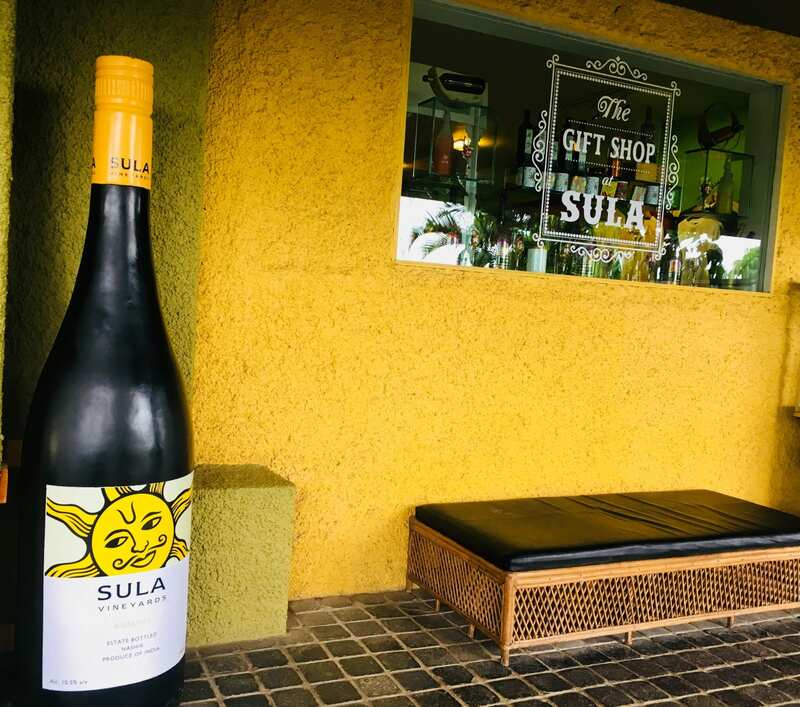 Besides conducting a wine factory tour, Sula Vineyards offers its visitors a wine tasting experience too. The passes are worth Rs.400/- per person. 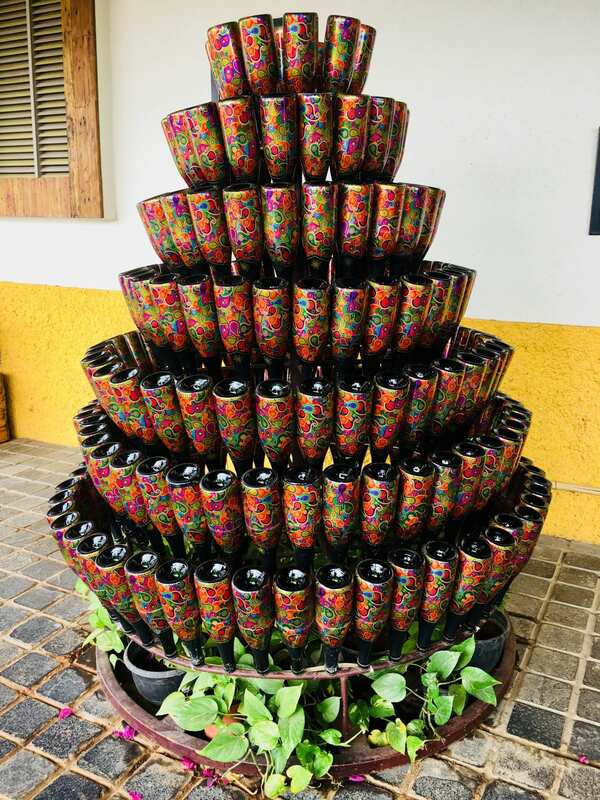 The gift shop, a restaurant named ‘Soma’ and a colourful wine store area situated in the premise are artistically designed, thus creating an ambiance and mood to explore the viticulture (the science and art of grape making) that surrounds you as one strolls around. The grape harvest at Nashik is during January to March, where Sula Vineyards hosts a Sula Grape Crushing Festival, where grape stomping events for the masses are organized, but my family enjoyed the off-season rainy ambiance and silent manoeuvring, which is such rare in a noisy & crowded Mumbai. The Sula gift shop interiors. I am not a fan of hard drinks. My first ever encounter with tasting any kind of alcohol was during my visit to U.K in 2012. I had participated in a Writers Retreat in Caerleon, Wales. I realized that wine was a part of special meals in U.K. It was at the retreat’s welcome luncheon, which co-incidently was my birthday too, when I tasted white wine for the very first time in my life! Perfect Mumbai Gateaway-Rains, silence, experiencing good viticulture ambiance at Sula Vineyards. All the gathered writers toasted for each other’s literary pursuits and made the best of the time spent together. In the flow of conformity, I somehow gulped the wine as it tasted bitter to me! I am averse to bitter tasting food/beverages, but as I pushed down the wine, I told myself, ‘When in Rome do like the Romans do! As a matter of fact, Caerleon was indeed a Roman colony in the ancient times! Soma- Sula’s restaurant in the backdrop. Due to my general aversion towards tasting bitter and sour foods/beverages, at Sula’s wine tasting session, I was sceptical of me experiencing the wine at first, but just out of journalistic curiosity and for awareness reason I went for it. The tasting session conductor introduced the participants 6 brands of wine which Sula produces. 4 out of 6 brands have bitter taste and one has to acquire a liking for it, as one consumes it regularly. But 2 out of 6 brands, particularly Chenin Blanc and Riesling are sweet tasting, which I personally enjoyed ‘Seeing, Sniffing, Swirling & Sipping’ (4 S’s of wine experiencing protocol)! 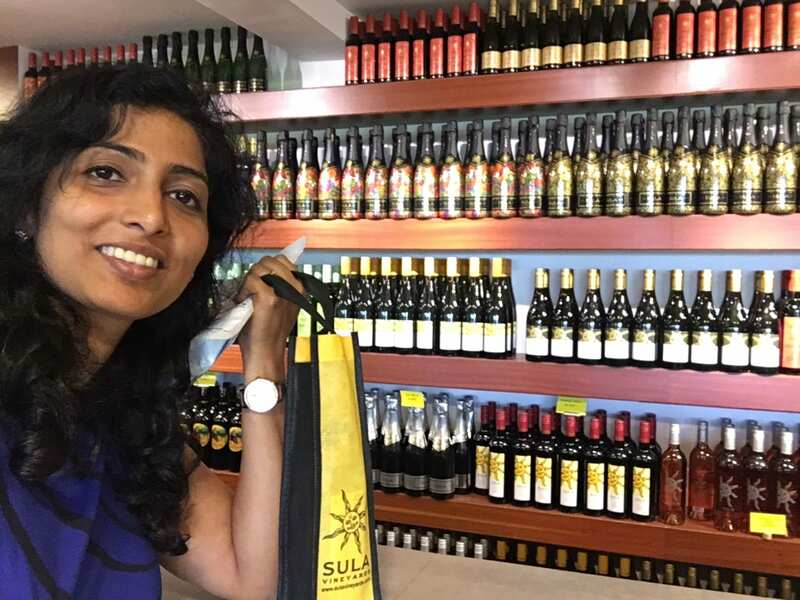 As me and my family bid good bye to Sula vineyards, we purchased souvenirs like bottle openers and a bottle of grape oil, which is promoted for healthy cooking practices. Sula, being an eco-friendly enterprise, the grape oil is a by-product of the grape which is produced on their vineyards. Sankulkar family visiting the Samant family’s business premise! Wine is an alcohol and alcohol consumption in India still is a cultural taboo among the masses. But, I believe, its up to each one of us to decide one’s limits of alcohol consumption. 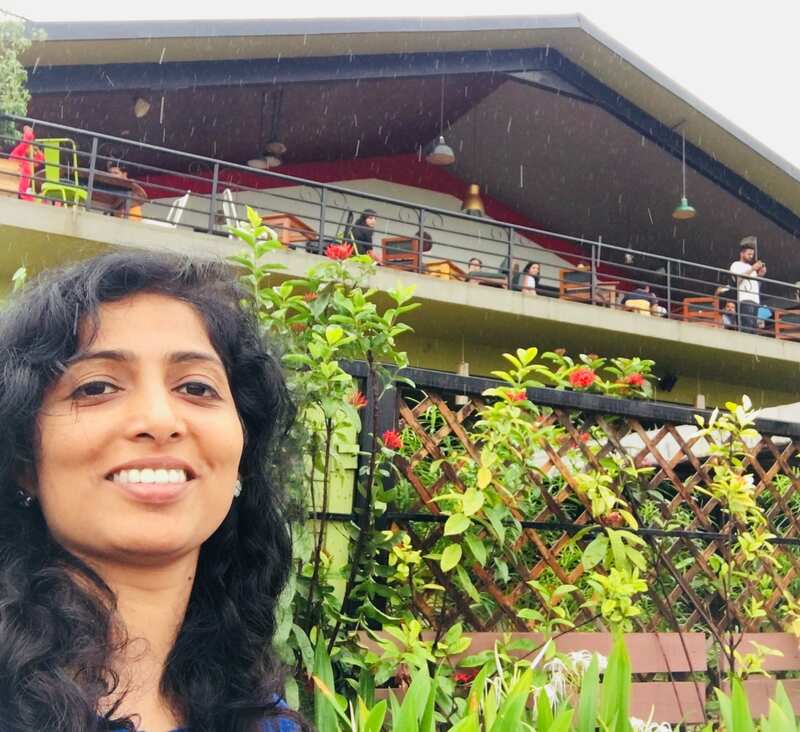 As I drove out of the huge Sula property, I felt good about 3 things. Firstly Sula, which is an Indian brand, is ranked No. 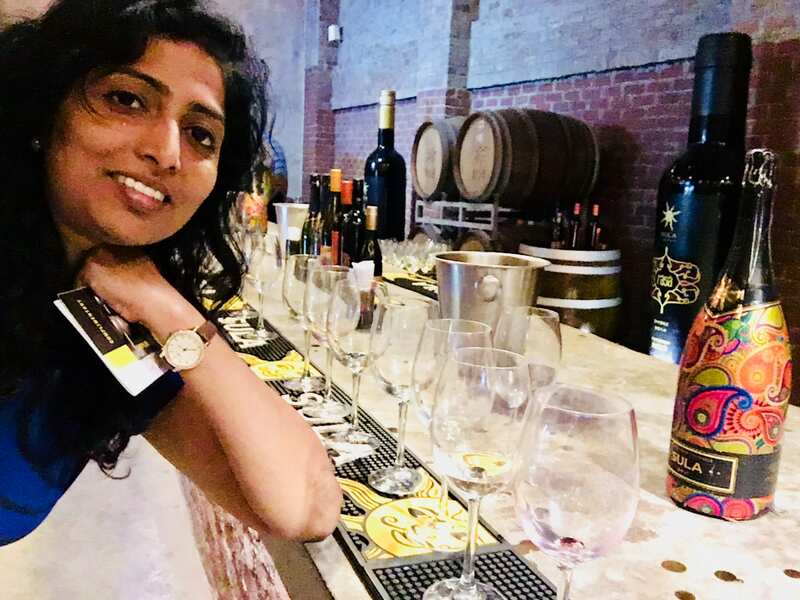 3 in the list of international wines brands, secondly that a Maharashtrian guy (Rajeev Samant) who was born and bred in Mumbai city, with his business acumen skills, has worked hard over two decades to put Nashik & Dindori on the world map of wine lover’s tourism. Lastly, its nice to know that many grape-producing farmers of Nashik have got a stable source of income by associating with Sula Vineyards by selling their farm produce to supplement Sula’s wine production. Here’s a video that explains the model: https://www.youtube.com/watch?v=qppxVFfNYqw Sula’s model is clearly a win-win sustainable business model which provides quality to the interested consumer and also provides benefits to the farmer who sell their crop to Sula, thus eventually bringing profits to the company which is today worth a Rs. 1000 crores business and is growing! Cheers! to all hardworking souls out there who like Sula are creating a holistic win-win model by not just uplift one’s work/business standards and revenue, but also making the world aware of the potential of their nation’s soil! 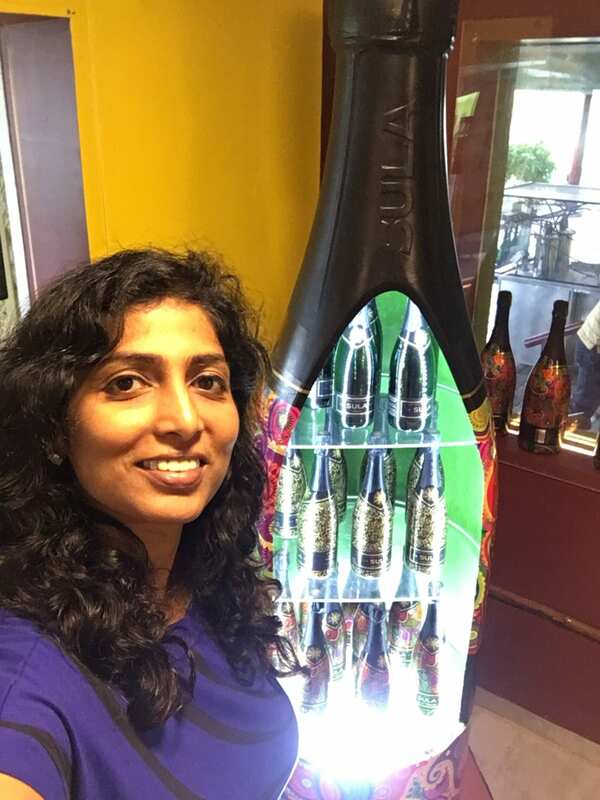 Innovative display of Sula Wines bottles.